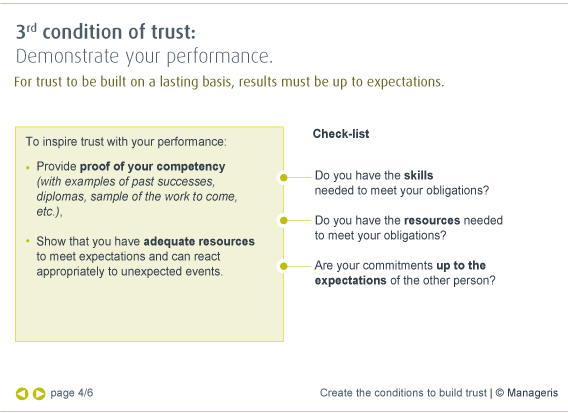 Trust is a key ingredient of high-performance teams and organizations, and is intangible. How can we foster its emergence and maximize the chances of building it to last? ¬ Do you make a good impression? 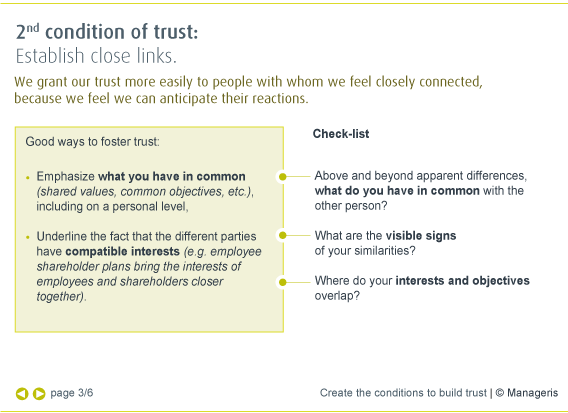 Desirable on a personal level, trust is also a key factor in business performance. This is what makes the difference between people who simply follow orders and those who take initiative, suggest improvements, and share information. Trust is thus one of the foundations for developing the agility and collaboration required in today’s business landscape. Yet, trust is rare and getting rarer, as shown by the studies compiled by the author of The Decision to Trust. Indeed,it seems that trust has become a remarkably scarce commodity across the entire world in recent decades, at every level of society! In the 1960’s, 60 percent of Americans felt that “You can trust most people.” Only 30 percent make the same assertion today. Similarly, the Edelman trust barometer shows that only 30 to 40 percent of an international cross-section of individuals in the US, UK, France and Germany consider that “Companies can be trusted to do the right thing.” These scores are dramatically lower than in the sixties, seventies and even the eighties. And this phenomenon is even more pronounced when it comes to institutions, where the measured level of confidence in the US Congress, for example, fell from 43 percent in 1966 to 8 percent in 2010! In such a mistrustful sociological context, how can you develop this key component of business success? First of all, point out the experts, companies must realize that trust cannot be forced. Trust implies taking the risk of relying on someone else, and this is entirely up to the person who makes the decision whether or not to accord his or her trust. There is consequently no point in demanding trust from others, as this only creates frustration and tension. A better way is to work on the key drivers that foster the emergence of trust and then adapt to each situation. 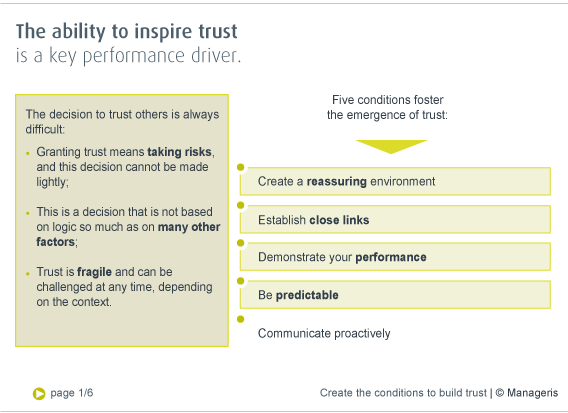 How to diagnose and reinforce trust in his or her organization? 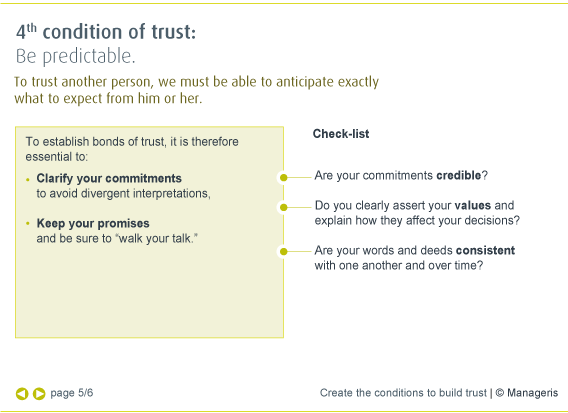 How to develop a communication conducive to trust? Recognize and surmount the many obstacles to trust encountered in an organization. 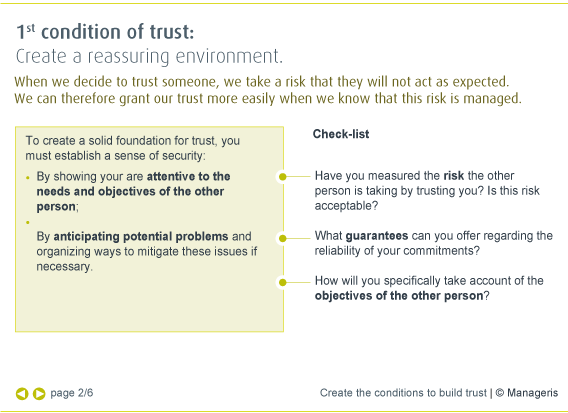 Understand the psychological foundations of trust to be more lucid about the pros and cons. Build trust with imperceptible and repeated signals. Know how to trust others, particularly in hierarchical relationships. Use contracts to reinforce, rather than destroy trust.